A strong body ply of optimized steel cord promotes flexibility for excellent performance and fatigue resistance for long life. The steel cord is specially designed for corrosion resistance and high adhesion to rubber. 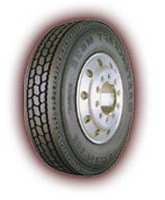 All-steel radial construction contributes to low rolling resistance for excellent fuel economy.